This sleek mini monolith looking device has internal antennas to keep things super tidy and will improve the coverage of any existing wireless router. 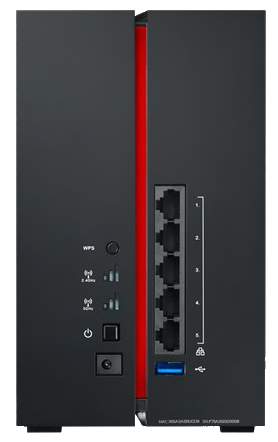 It works as a repeater, so you can extend your wireless networking to previously hard to reach parts of your home and with extremely fast 802.11ac speeds up to 1900 Mbps this ensures a reliable high-speed internet coverage everywhere for the your new AC wireless ready gaming laptops, smartphones, game consoles, and smart TVs. For older devices you’ll be happy to know it still supports the classic 2.4 GHz as well as the newer 5 GHz frequencies, this dual-band repeater will allow you to split users and connect different devices so your latest tech can enjoy the benifits offered via the less congested, faster 5GHz frequency for tasks such as streaming HD content, transferring large files and of course all the usual good stuff. Getting the perfect placement and setup is pretty easy thanks to a nice LED signal indicator Asus have included on the device, this provides a visual showing the strength of the current WiFi signal and makes finding the optimal position for the Asus AC Repeater a breeze. File sharing becomes pretty darn easy as well, simply connect your USB storage drive into the repeater’s USB 3.0 port, and users connected to your network can access the files. Along with this single USB 3.0 port, you’ll also find five built-in Gigabit Ethernet ports which you can use to connect cable savvy devices that you previously had to run those ridiculously long cables all the way from your modem, I think we’ve all been there! This high-performance wireless kit really works, we’ve used it in our own GGPC office to connect multiple PC that were previously in a dark zone and not having to run 20 meter ethernet cables is a definite win and even though nothing beats that direct connection if you’re playing a fast paced competitive game like Overwatch, it performed perfectly well when we played games like Star Citizen, Black Desert Online and quite a few more so on that note we are happy to give the Asus RP-AC68U our GGPC Recommends Award – the Asus AC Wireless Repeater is GOOD! 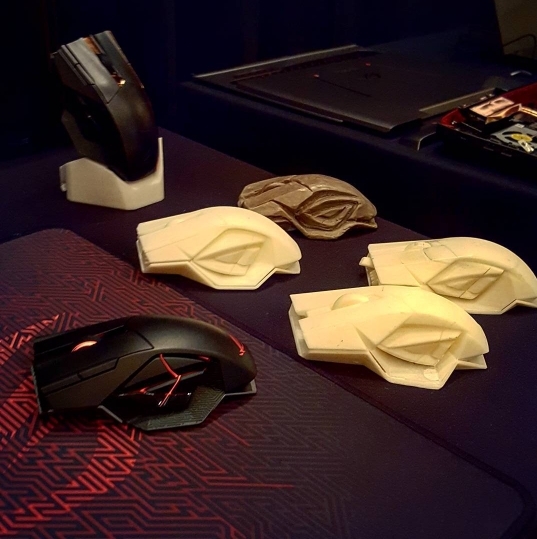 We first caught a glimpse of the ROG Spatha Gaming Mouse when we attended at Computex last year (along with a killer keyboard we’re still hunting for) and it made for quite the impressive setup, at the time we didn’t realise this was going to be wireless! 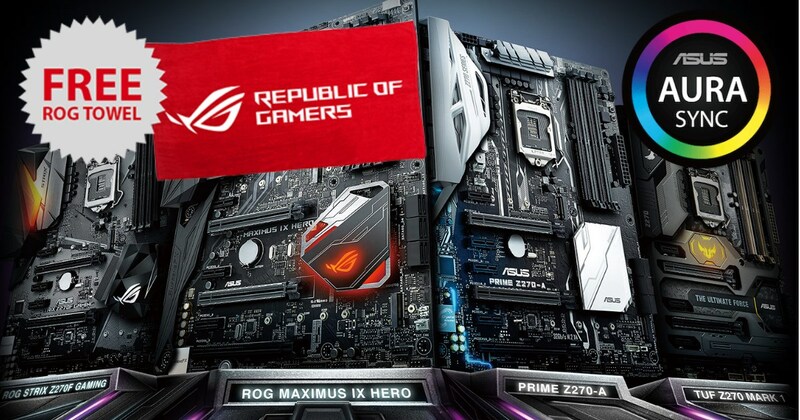 The effort that Asus have put into the design of this large, sturdy, wireless mouse is quite remarkable – It packs a total of 12 programmable buttons, but the 6 side buttons are arranged in a way that forms the ROG EYE, this is quite a awesome feat with form meeting function in an excellent way. 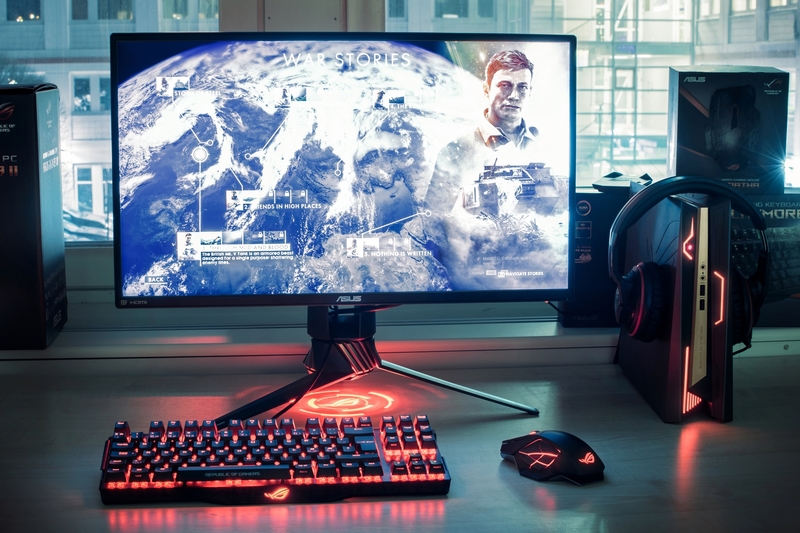 The mouse is extremely responsive with specs much like the Logitech Chaos Spectrum wireless experience, giving a 1000hz refresh rate wirelessly and a staggering 2000hz (0.5ms) refresh rate for the ultimate performance over a wired connection. Spatha is quite heavy in comparison but when you hold it you can tell it’s all because no expense was spared making this quality mouse, it uses the renowned Japanese made Omron switches and should you want to change them, ASUS have made things easier by making them interchangeable within sockets and have even included an extra pair 🙂 The angles of the buttons seems to put everything in reach and my mid sized hand fits comfortably over the large frame. With such impressive attention to detail in the Spatha, Asus have undoubtedly created a premium gaming mouse. Fun times ahead as we thrash this beast through a range of games, we’ll update our computers blog and GGPC Instagram with more glorious pics soon! UPDATE: Well then, this was totally blown out of the water by the new GTX 10 series gaming laptops wasn’t it! 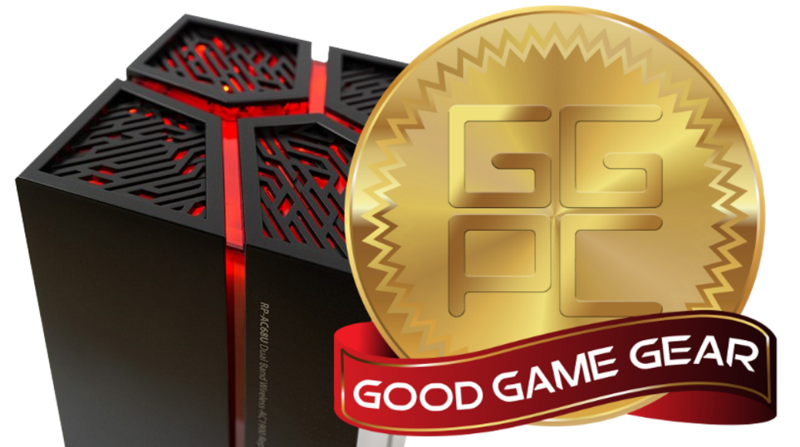 The Republic of Gamers GX700 is one of the most highly-anticipated laptops this year, and rightly so with a radical design that enables a whole new level of cooling and potential for the highest possible performance – it’s a genuine portable desktop replacement. 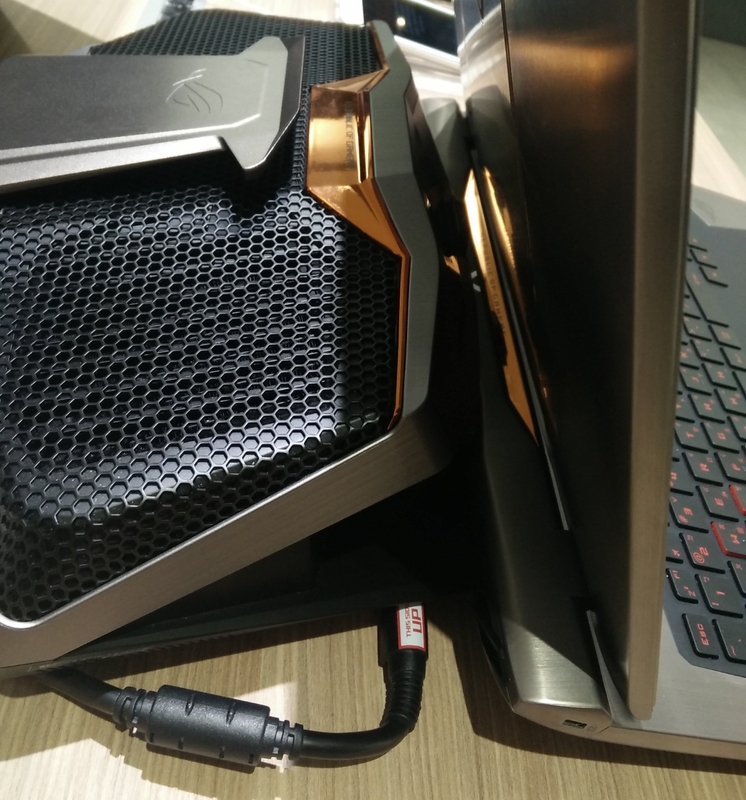 This gaming beast of the machine sets itself apart from the rest with the a fantastic liquid-cooling dock system for the laptop and this enables some rather extreme gaming performance along with overclockability while fully utilizing the intel HK-Series Skylake processor, and the mighty desktop GeForce GTX 980 in a notebook form factor – that’s the Nvidia GTX 980! (not GTX 980M). That’s one crazy graphics card for a laptop! 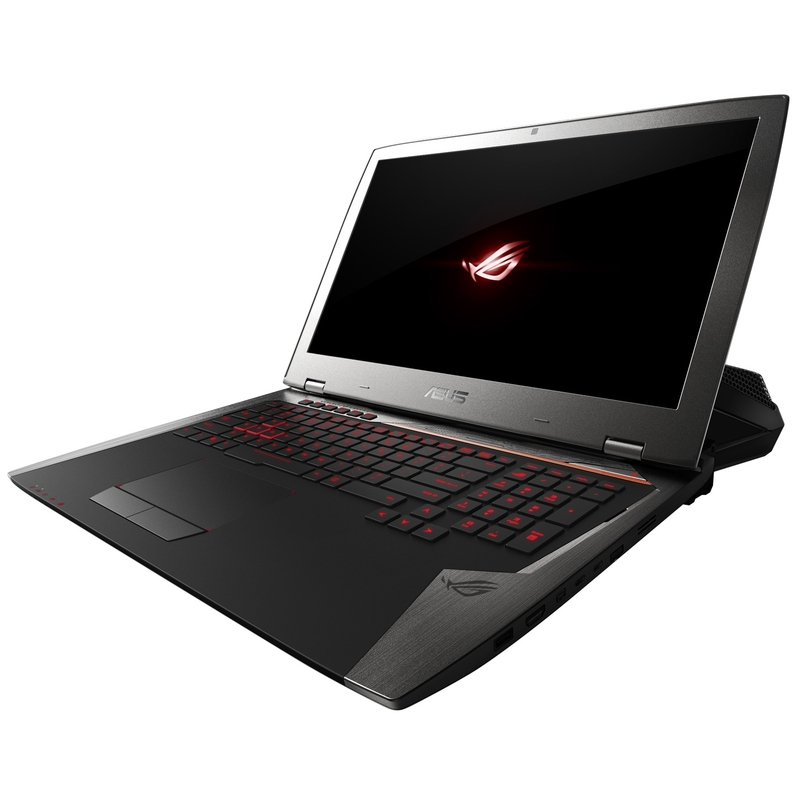 The ROG GX700 is one of the several enthusiast grade laptops packing this extreme hardware, and it’s not a toned down version either. This GTX 980 has more CUDA cores and texture mapping units than the GTX 980M and performance aligns with the desktop version of the graphics card. It’s also worth noting that the GX700 GTX 980 has 8GB of memory vs the 4GB available on a desktop card like the Asus Strix GTX 980. Full credit to Asus design team for how easy it is to dock the cooler onto the back of the laptop and also for little touches like the single power cable to help reduce clutter. 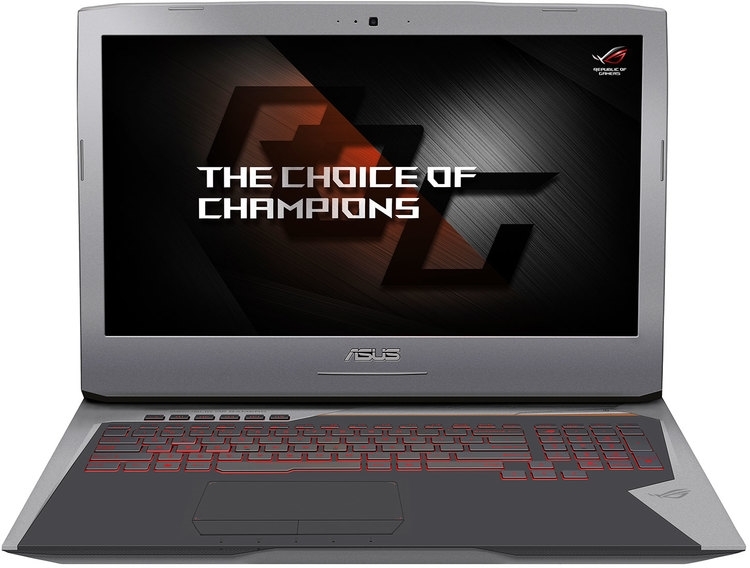 Just a few of these marvelous machines have landed in New Zealand, so if you’re after one don’t delay – grab yourself a GX700 ROG Gaming Laptop today!